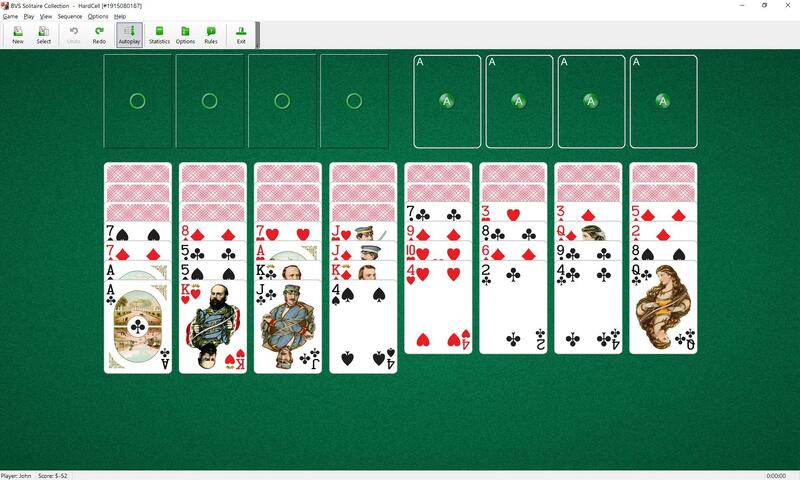 This solitaire uses 52 cards. All cards are dealt into 8 tableau piles The top four cards in each tableau pile are dealt face up. Four cells (to the left) and four foundation piles (to the right) are placed above the tableau piles. The top cards of tableau piles and cards from cells are available to play. You may build tableau piles down by alternating color. Only one card at a time can be moved. The top card of any tableau pile can also be moved to any cell. Each cell may contain only one card. Cards in the cells can be moved to the foundation piles or back to the tableau piles, if possible. When a tableau pile becomes empty, that space can be filled with a single card from a cell or the bottom card of another tableau. 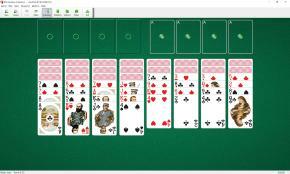 s: This game is a variation of FreeCell. state that you can move only one card at a time. But, as a shortcut, BVS Solitaire Collection will allow you to move a full or partial build if there are enough empty tableau piles and empty cells, because you would have been able to get the same result by temporarily moving the extra cards into these empty spaces. This kind of move is called a supermove.